Recently we wrote a post on the best practices for adding telemedicine visits to an already busy workload. But once you’ve come up with a weekly timetable for designated days/times for video visits, you need to fill those slots with patients. So how are patients informed about your telemedicine program and the option for a video visit? We’ve outlined the best practices below. Capture patients’ attention as soon as they walk in the office door. Window clings on outside windows will spark interest before a patient checks in for an appointment, and increases the likelihood of them asking front office staff or their physician about this possibility. Educating patients with brochures and posters in the waiting and exam rooms also allows for great visibility – especially when a patient is waiting for their appointment. A dedicated web page linked from your website is beneficial when launching a telemedicine program in your practice. Provide an online resource as a place patients can seek out information about video visits. Include your logo, telemedicine info specific to your clinic, and online appointment requests so that video visits feel like they are part of your practice. Send email campaigns to patients to announce and remind them that video visits are a convenient option for many appointment types. Reach your patients online through social media and blog posts. Be sure to announce video visits as a new service in your practice. Include a call to action and ask patients to request a video visit for their next appointment. Everyone turns to the internet when looking for suggestions these days: from new restaurants to body shops, and medical care is no different. Make sure your practice is listed on review sites (like Yelp) and encourage your patients to leave a review if they enjoyed their experience. Listing your practice on sites like ZocDoc can help attract new patients and allows for easy scheduling. A dedicated knowledge base for patients allows them to quickly answer any questions that may arise about their upcoming video visit. 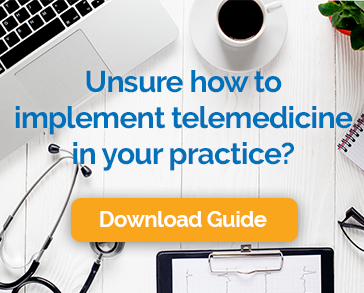 This includes articles on setting up a telemedicine account, tips for a successful video visit, and any imperative FAQs. There are many easy (and inexpensive) things you can do to drive video visit appointment volume and educate patients about telemedicine. Fortunately, Chiron Health is here to help with marketing efforts, as many of the items above come included with our service. Schedule some time to talk to our telemedicine consultants for more information on how Chiron Health makes it easy for your practice to offer (and market) telemedicine appointments to patients!